All Sri Lankans should stand up against the lawlessness in the land, Anoma Fonseka stated following the three year sentence given to her husband Sarath Fonseka today in conclusion to the White Flag hearing. She claimed that she was already prepared for the outcome of the verdict while stating that she was neutral towards the decision of the High Court. 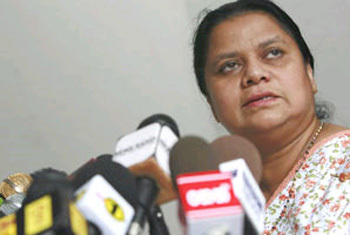 Mrs. Fonseka added that all those who wish to stand up for democracy should unite while stating that she will not stoop as low as to curse anyone over this decision. Meanwhile, Sarath Fonseka’s lawyer Nalin Ladduwahetty stated that steps are being taken to appeal the decision given by the High Court today sentencing Fonseka to three years in prison. He stated that the record of the proceedings will be given today after which an appeal will be filed to Appeals Court on Monday. Solicitor General Buwanaka Aluvihare while addressing the bench stated that because the allegations against Fonseka were filed in accordance with the emergency laws at the time, a sentence of five years should be given along with a Rs.5000 fine. However, Ladduwahetty stated that the sentence should be reduced due to the 40 years of military service Fonseka has rendered to the country. Before the sentencing, Fonseka made a statement to the Court stating that the verdict was unfair and that it was not acceptable in a democratic nation. He added that this sort of decision would only be given in a country that is ruled by a dictatorship.